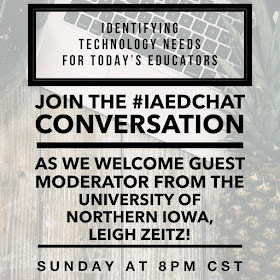 This Sunday, I will lead a tweetchat at #iaedchat on Sunday (10/21) @ 8:00 CDT. 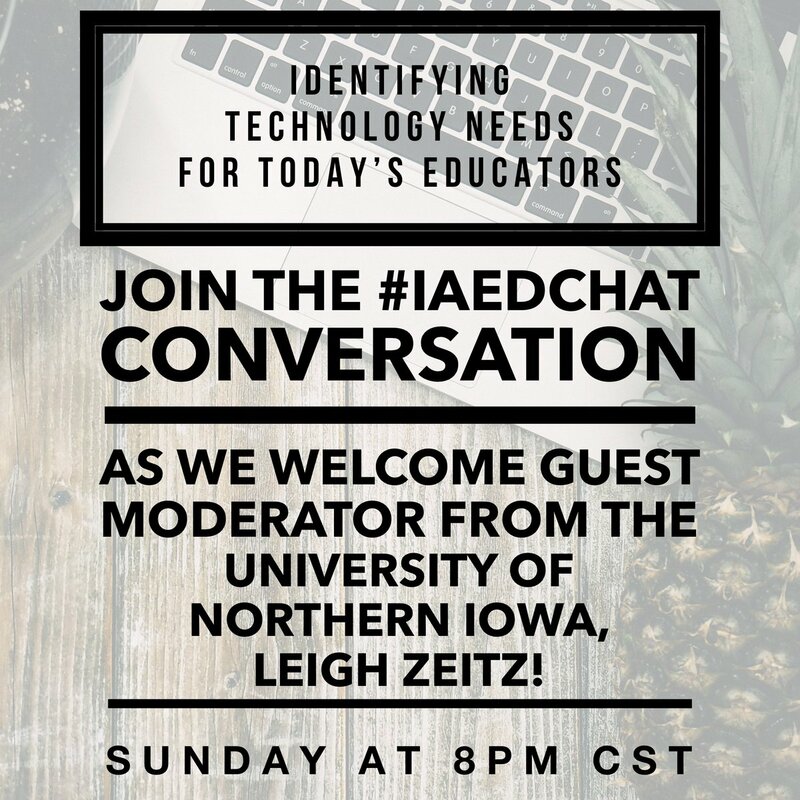 We will discuss the skills, tools, and mindset that teachers who are successful in using educational technolog have in today's classrooms. Are new teachers coming to your schools with the Ed Tech skills necessary to optimize technology in your classes? What Ed Tech skills do you expect your new teachers to have? What future technology-enhanced projects do you have planned? How are you aligning the ISTE standards into your curriculum? Are digital portfolios important to you when you are reviewing applications for employment? How important is it for a new teacher to have an Ed Tech minor? How would you advise Teacher Education programs to better prepare your new teachers for success in your schools? I must admit that I recommended this topic to Dan Butler et al. because I wanted to find out what ed tech skills you expect of your new teachers. Having said that, Dan pointed out that this is a question that spans the whole teaching experience from beginning to end. As usual, Dan was right so we want to discuss this in reference to all teachers. Audience? We hope to have administrators, coaches, teachers, parents and anyone else who is interested in this topic. New to Tweetchats? If you have never been engaged in a tweetchat or want some pointers about how to get the most of the experience? Check out my posting, 11 Tips towards Engaging in a Terrific Twitter Chat. Leave a comment below if you are planning to attend. You don't need to RSVP to a Tweet chat, but it's fun to see that educators are reading this and plan to engage. Have a SUPER weekend. See you on Sunday.